Culture celebrates doing something new and different and innovative and game-changing. Rightfully so, because paving a new path opens opportunities for others to follow in those footsteps. However, while you may aspire to do the same, it’s easy to forget what often comes with that territory: doubt, second-guessing, worrying, setbacks…the list goes on. As one of my mentors tells me often, “In order to get something you’ve never had, you have to do something you’ve never done to get it.” And the same can be said of our society. If we hope to have a country that sees gender equality in leadership across business, if we hope to have a more level playing for women in technology, if we hope to see innovation that has real impact, then we have to make changes from the inside out – institutions have to adjust and simultaneously so do we. Like anything in your life, creating and acting despite your self-doubt in a new situation, job, or challenge can be wildly uncomfortable. 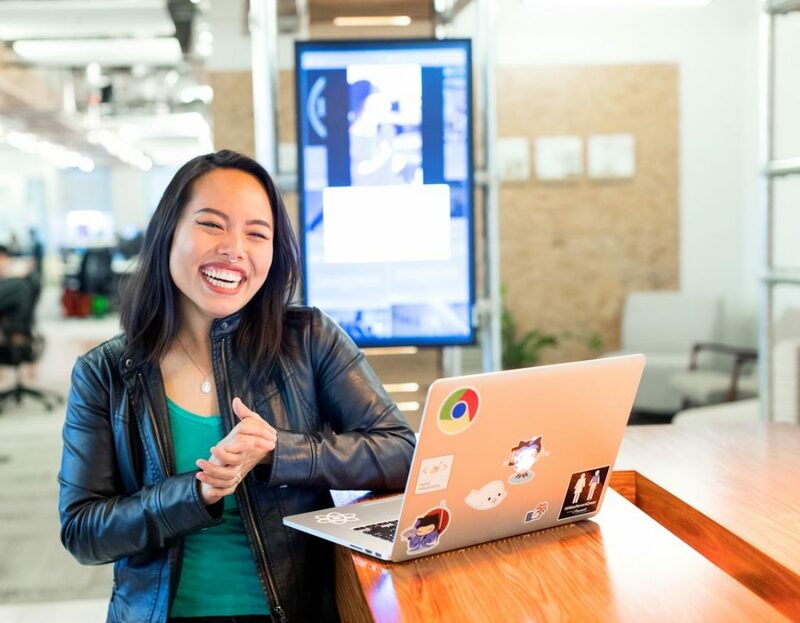 As I spoke with Jen Van, senior full stack and machine learning engineer at Capital One, it was inspiring to see how both systems – the institutional and the individual – can mutually come together to create a culture of pushing the limits (and thriving). First, look for people who believe in you. When you meet someone who sees your value and reminds you of it – listen. And keep them close. Jen recounted a seminal moment in her life that opened up her world to the possible future she’d have in tech. When on the verge of tears after being unable to finish an assignment, her superior said sharply, “You are good enough to do this. Does anyone out there know what you do?” It’s those moments that you realize how much you’ll have to push through the doubt, and how others can help you get there. A community of believers is necessary in creating what you didn’t know was possible. It’s there that better solutions can be found. However, you mustn’t silo yourself. Second, don’t be afraid to ask for help. Acting like you know everything can be tempting – because it seems stronger, it seems smarter, and it seems like it’s what you should do. But actually, the most powerful tool you have in your arsenal of excelling is asking those who know more than you to show, teach and explain what you don’t know. “I’ve lived a life where I didn’t know, and I acted like I did. That didn’t work out well for me,” Jen explained. So when she was tasked with a giant new project and felt like she didn’t have the experience to succeed, she asked for help. And it’s imperative that she did, because the best digital innovators are those who seek constant improvement. What did Jen receive in return from her Capital One team? A whiteboard session that helped her sort out exactly what she didn’t know. Because she asked for help, she received all the tools, leadership, and encouragement to succeed. “There was no limit to the amount of support I had,” she said. That’s what comes from an environment that truly embraces growth mindset: not knowing isn’t admitting defeat – it’s being smart enough to know that learning and growing is greater than any one individual’s ego. Third, give what you’ve received. Innovation and impact rarely happen because someone did it alone. There has to be a cycle of support, mentorship, and collaboration. So, when you’re on the receiving end of it, as Jen was, it’s important to give it back. “I tell women they’re great, that they can do this. And I check in with people so they’re empowered.” As Jen says, it’s imperative to share what you wish you’d known when you first started, to connect with other women so you can keep learning, and to keep pushing through. On the other side, is impact bigger than you thought possible. So, search for support, for mentors, for people who push you and people who will catch you when you stumble. And whatever you do, be the person that will give that right back. Because that’s where real innovation and impact is possible. Working around tech and women’s leadership, I’ve seen firsthand how important having women at the helm of the future of innovation is, which is why I’m proud to partner with Capital One to create this post. These are my opinions, obviously. Learn more about tech jobs at Capital One here.